Everything was going fine with the chutney-making. Apples of 3 varieties (Jonagold, Liberty and Honycrisp from South 47 Farm) and onions (of the tear-producing variety) had been chopped, combined with organic cider vinegar (complete with veil of the mother), brown sugar, sultana raisins, and brought to a boil. Mustard seed, ginger, chili flakes, turmeric, cardamom, cumin, and coriander had been measured and added to the pot. The pungently fragrant concoction had been allowed to simmer for just over an hour, and I had, in fact, stirred continuously to prevent sticking for the last 10 minutes or so. The chutney was ready for canning. I filled eight clean half-pint jars (ouch, hot! ), fitted the caps on, and screwed on the rims. The canner, water almost at a boil, was waiting. I lifted the first jar, lowered it into the water. There was an unfamiliar "pop" sound as I set the jar on the rack. I didn't think much of it, and continued to fill the canner. As I placed the last jar into the canner, I noticed something in the water. It looked like... a piece of apple? And, wait, there was a raisin, too! Yikes! That unfamiliar "pop" was the sound of the first jar breaking. Using the jar lifter (the water was boiling now), I pulled the first jar out. It had no bottom. The chutney was thick enough that most of it had remained in the bottomless jar, which I quickly upended. The remaining seven jars had their full 10 minutes in the boiling water; the popping made by their lids as they cooled and sealed was a good sound. 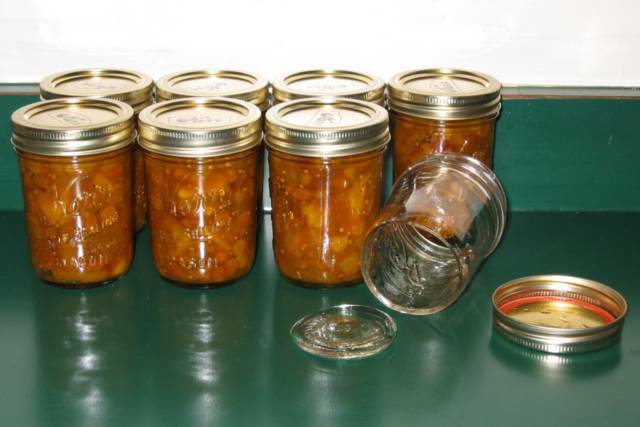 And here are the end results of yesterday's little adventure in home preserving: seven jars of golden curried apple chutney, and one broken jar. You may not be able to tell from the photo, but the break was extremely clean. The jar was brand new. Go figure. There was a little chutney that didn't fit in the jars. It's in the refrigerator, and I can tell you that, even freshly made, this is yummy stuff: sweet, very spicy, a little hot. After a couple months' mellowing in the cellar, it's going to make some nice cheese (or pork, or turkey) very happy.